Fruit smoothie bowls are great, but what makes them extra special are the toppings. We made our raspberry smoothie bowl with creamy Vanilla Shakeology and decorated it with fiber-filled oats, chia seeds, and pumpkin seeds. Don’t have Shakeology yet? Talk to your Team Beachbody Coach or get it here. 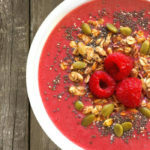 This raspberry oats smoothie bowl is a delicious, high-protein breakfast! Place almond milk, Shakeology, ¼ cup raspberries, oats, and ice in blender; cover. Blend until smooth. Place smoothie in a medium bowl. Top with remaining ¼ cup raspberries, chia seeds, and pumpkin seeds; serve immediately.